Part FIVE in our series of interviews with candidates in the County Council special election. 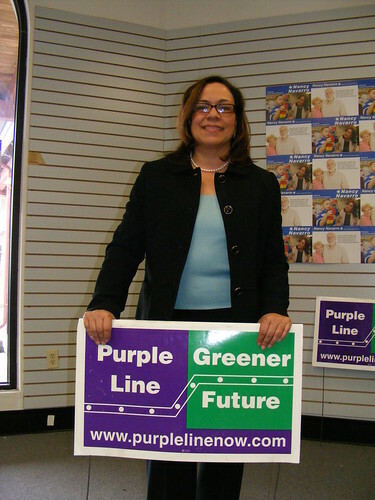 For more information on Nancy Navarro, check out her campaign website or our interview from last year's election. Navarro at her campaign headquarters in Plaza del Mercado. 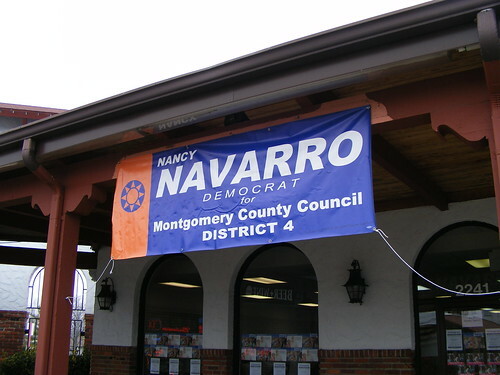 When Nancy Navarro decided to run a second time for the District 4 County Council seat, she knew she wanted a campaign office. But as the only Latino running in the race, it's funny that her new headquarters are in Plaza del Mercado, the Spanish-themed shopping center at Layhill and Bel Pre. 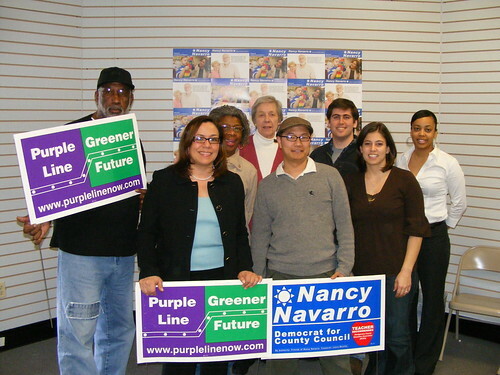 Campaign volunteers Alexis Reed, Ken Silverman, Dolly Kildee, Cornelia Parish and Russell Jackson with Navarro (center left) and campaign manager David Moon (center right). After years of working in volunteer organizations and serving on the PTAs of her children’s schools, Navarro was appointed to fill a vacant seat on the Board of Education in 2004 before being elected for a full term two years after. The jewel of her tenure on the Board of Education is the Kennedy Cluster Project, which aims to close the achievement gap between white and minority students in the cluster with Montgomery County’s largest population of Black students. Multiple County agencies are brought together to form a “safety net” for at-risk students, “leveraging existing resources to have a better impact,” explains Navarro. Navarro's campaign headquarters in Plaza del Mercado. Much as the achievement gap makes it difficult for minority students to excel, Navarro feels that minority politicians have a similar struggle, expressing a frustration with local elected officials being 'delivered' into their positions. In last year’s election, she claimed County Executive Ike Leggett – who endorsed her opponent, former Councilmember Don Praisner – urged her to drop out of the race. Meanwhile, a district with a large and growing minority population lacks a representative of color or a political base to help put them in office. 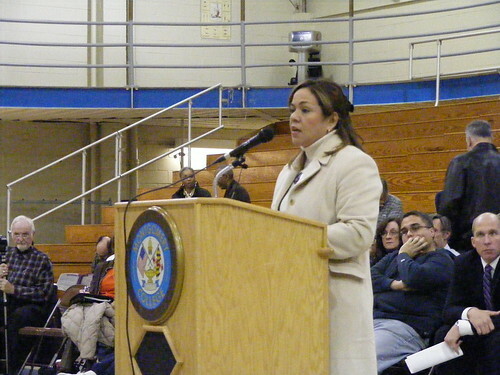 Navarro testifies at a Purple Line public hearing last fall. 20853 and 20906 do indeed have some of the highest levels of foreclosures, that's a fact. But if you go look at the Legal Notices section of the Montgomery Sentinel newspaper, and then compare those notices and the addresses to the Maryland department of assessment and taxation website, you see that a lot of these were people who bought these properties with "stated income loans" (also known as "liar loans"), merely alleging their incomes, and securing mortgages with very low initial payments that reset after a few months... unless they refinanced the whole thing at an inflated home price. So the constant refinancing helped inflate home prices around here. We're all paying for that, all across the country. Additionally, a lot of the homes facing foreclosure were being run as flophouses for workers during the construction boom. Aspen Hill Civic Association, Inc., has for a long time pressed for enforcement of County Code to stop this practice, and nothing significant was ever done. Now, what the County Code could not do, economic calamity is doing. How very sad that the rest of us are once again victimized by the aggressive sleazing that skirts around ad the edges of the law to get what they want, while making the rest of us pay. The people clamoring most loudly for assistance with their mortgage payments are the ones who caused the economic calamity. Don't blame Wall Street, they're not the ones who inflated house values by repeatedly refinancing usurious mortgage loans. Sure they should have actually checked to see if people had reliable sources of income, and renting out your basement to 20 people should not qualify as "reliable". And let's not feel so sorry for the people who just lost their construction jobs, or their ill-gotten income from renting out their basements to the construction workers. Why not feel sorry for all of the local poverty-stricken citizens who could not get a job for years because the market was saturated with cut-rate workers? Why not feel sorry for the longtime local citizens who have nearly a 50-percent rate of unemployment, and who have had to live in subsidized housing for most of their lives? At least they don't have to worry about foreclosure. And what about crime? Plaza del Mercado Shopping Center is smack in the middle of one of the highest-crime precincts in Montgomery County. I was living here when Plaza del Mercado was a cow-field and I've been working in anti-crime and neighborhood uplift issues since 2002, most of that focused right there or just down the street. I take no pride in the fact that for the last decade or so, Aspen Hill was one of the places in Montgomery where statistically one is most likely to be murdered. Even without the Serial Sniper killings, there was the murder of the cashier at the Sunoco at the corner. Malik McCoy was beaten to death by a gang pretty much right around the corner. Gerard Lacayo got knifed to death here. In fact there's a lot of knifings going on around here. Lots of gang activity. Lots of Grafitt. We've even got lots of sleeping drunks. We've got homeless drunks painting graffiti in the middle of the woods and leaving piles of bottles in the local parks. Now, it's clear that Ms Navarro knows about Education, but does she even know that the woods are filling up with camps of the former workers who got displaced from a lot of homes that went into foreclosure? Let's think of the children for once, okay? Let's think about our wooded parks filling up with drunk unemployed construction workers. Let's think of the owner of these little pink sneakers that I found near a homeless camp in Aspen Hill Local Park. I can only hope that the owner of those sneakers didn't go down to the park to try to entertain herself and unfortunately run into the guy who misplaced his pants. Or maybe that's her pants. Someone please tell me how better schools are going to do something about this. Oh, and in closing, let's keep in mind that so long as we have Development -- lost and lots of Development -- all of those unemployed construction workers can all have jobs and go back to living 20 to the basement in overpriced flophouses in converted single-family detached residential homes in neighborhoods that aren't zoned for that. If anyone actually thinks I am seriously proposing this as a solution -- much less an acceptable solution, I have some advice for you. Go to your computer's Control Panel, and check to see if maybe you left your Sarcasm Detec tor turned off. The light should be blinking rapidly, and brightly. I'm about ready to propose, more seriously, that it's time for us to see about getting some used FEMA Trailers just in case the homelessness problem rises to post-Katrina levels. Better get in line before everyone else thinks of this, there's only a few hundred thousand to go around. Nancy Navarro voted to give school employees a 30% raise over three years in a recession sticking it to homeowners with a 13.5% property tax increase. Hold on to your homeequity if she is elected. She will put her hand in our pockets to benefit every special interest.